This wonderful Postcrossing postcard came to me this week from Germany, DE-1961098. 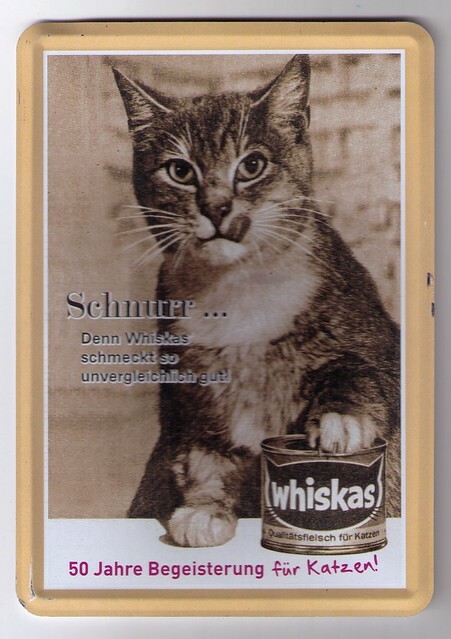 The artwork is fabulous in and of itself - reproduction of a vintage cat food advertisement from Germany. I think that cheesy kitty tongue is painted on/doctored on the original photo, which only adds to the kitschy kitty charm. Double fantastic, though, is that this postcard is metal! I guess it's some kind of tin/aluminum thing, sort of like old metal advertisements, but the backing is paper-coated so the sender just wrote on it with an everyday ballpoint pen. It's clearly been hand canceled, but still, I'm amazed it arrived in such perfect condition. I've gotten wooden and plastic postcards before, but I think this is the first metal one I've received. Very, very cool. Also, I love learning that the German word for "purr" is "schnurr." How delightfully onomatopoeic! Thank you, Google translate, for helping me figure that the rest of the caption is "Because Whiskas tastes so incomparably good." Schnurr! Oh my, that's adorable! I just love those old(looking) tin/metal signs. Now, that is one cool card. Lucky you!